Despite a number of proposals and public comments in favor, the Board of Fisheries made few changes to the Lower Cook Inlet’s winter saltwater king salmon fishery. During its final Lower Cook Inlet cycle meeting Saturday in Homer, the board took up a variety of proposals related to the fishery, which typically takes place between Oct. 1 and March 31 in the saltwater south of Bluff Point. One group, Cook Inlet Recreational Fishermen, submitted a set of proposals asking the board to liberalize the fishery in light of new genetic research showing that most of the king salmon in the area during the winter are not Cook Inlet stocks. 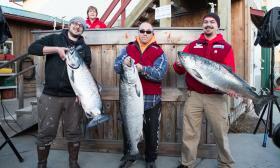 The only proposals the board approved were by the Alaska Department of Fish and Game. One expanded the winter king salmon management plan to apply for an extra month, now including September, expanded the fishery to include all of Cook Inlet and raised the guideline harvest limit from 3,000 fish to 4,500 fish. Part of the reason for the increase in the harvest limit is to account for the number of fish harvested in September. During the winter king fishery, fishermen do not have to record their harvests and the kings caught during the winter fishery do not apply to the Cook Inlet five-king annual limit. Because the winter management plan will now apply in September, fishermen won’t have to record their harvests that month for kings greater than 20 inches long. The harvest limit is only calculated after the season and is used as a gauge for Fish and Game managers to determine what to do with the fishery from year to year rather than as an inseason tool. The fishery exceeded the 3,000-fish limit in 2013, 2014 and 2015, possibly because of high participation in the past few years, said Carol Kerkvliet, the area management biologist for the Division of Sportfish in Homer. “It could be a combination of just the weather makes it appear that way, and the word’s getting out of something fun to do in the winter, to go fishing,” she said. Because most Alaska’s king salmon stocks have declined significantly over the past decade, including Cook Inlet stocks, several board members noted that they had concerns for the potential interception of mature king salmon, which migrate back to their spawning streams between April and August. Board member Sue Jeffrey noted concern for the king salmon stocks in the area, especially because run timing can vary for any anadromous fish. Fish and Game biologists have been gathering genetic data on kings harvested in the fishery, though, and excluding the early summer, the kings harvested in the marine fishery south of the Bluff Point are almost all non-local stocks. Stocks of king salmon elsewhere have been experiencing high production, showing up in Cook Inlet to feed in vast numbers. Even if there are mature kings in the area, the much larger numbers of nonlocal feeder kings would contribute to a type of swamping effect, making it unlikely for the larger kings to be caught, Kerkvliet said. The only one of the group’s proposals that got traction was one that would have eliminated the annual limit on the king salmon harvested in the winter fishery south of the Anchor Point Light. There’s currently no annual limit for winter kings less than 20 inches long, so the proposal would have eliminated the limit on larger ones. Other areas of the state have similar policies. Board member Israel Payton said he felt the proposal would only allow the fishermen to keep slightly bigger salmon, which wouldn’t create too much of a problem. However, the board voted it down 1-6, with Payton voting for it. The commenters during both the public comment day Wednesday and the committee process on Thursday were divided between some wanting to harvest more of the kings because they are nonlocal stocks and are relatively plentiful and others who cautioned on the side of conservation because the kings in the bay are still someone’s kings, even if they aren’t Cook Inlet kings. During the committee discussions Thursday, Fish and Game Deputy Commissioner Charlie Swanton said it was clear the guideline harvest limit was meant to apply to nonlocal stocks harvested in the area as well. Even if the fish originate in Washington or Oregon, the fisheries managers there are releasing hatchery fish to rebuild the stocks in some of the rivers there that have declined over time or as mitigation for habitat damage like hydroelectric plants. The proponents said Cook Inlet’s harvest of winter kings is so minimal that managers in the kings’ origin areas do not account for it. Pete Zimmerman, the spokesman for Cook Inlet Recreational Fishermen who submitted all of the group’s proposals, said he was disappointed the board did not pass any of them. The group hailed the genetic study from Fish and Game and presented its own data from coded wire tags recovered from fish harvested by salmon trollers, both of which showed that most of the fish harvested in the winter saltwater king salmon fishery hail from elsewhere. Zimmerman said he thought this would have held more sway. “We were pleading with them all along to pay attention to the science,” he said. He said the group will likely bring the proposals back again but may not wait the full three years until the next Lower Cook Inlet cycle.